Seenacar.com – a new site for private car sellers – offers those struggling to find a buyer for their car a comprehensive package, maximising their chance of selling. Users buy a £24.99 Seller’s Pack, which includes in car promotional material, which is designed to catch the eye of people passing the car on the street. It also allows potential buyers to access details of the vehicle at the roadside. 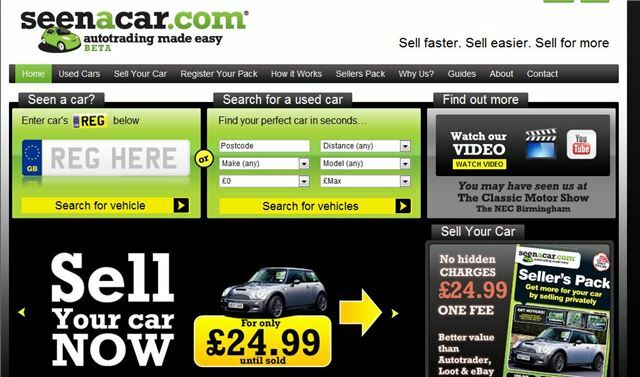 The package also includes a listing on Seenacar.com – which remains there at no extra cost until the car is sold. There’s also professional listing and selling advice, an SMS facility which allows texters to find details about the car, and an Experian Autocheck to reassure buyers about the cars past. Potential buyers can also find all of the information about the car by entering the registration number on the Seenacar.com site.